On Wednesday April 13, four students from the Student Investment Advisory Service Fund (SIAS) arrived in Chicago, Illinois to attend the ENGAGE International Investment Education Symposium with thousands of students, professors and investment professionals from around the world. 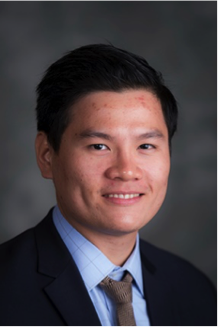 Sukhmanjot Brar, Dmitrii Desiakov, Savva Cherdantsev and I, An Hoang, were chosen from a very competitive pool of candidates to represent SIAS and Simon Fraser University. ENGAGE is the largest international student investment conference, where students participate in a diverse set of panel discussions to broaden their knowledge of the investment industry and to express their perspectives on current economic and finance issues. 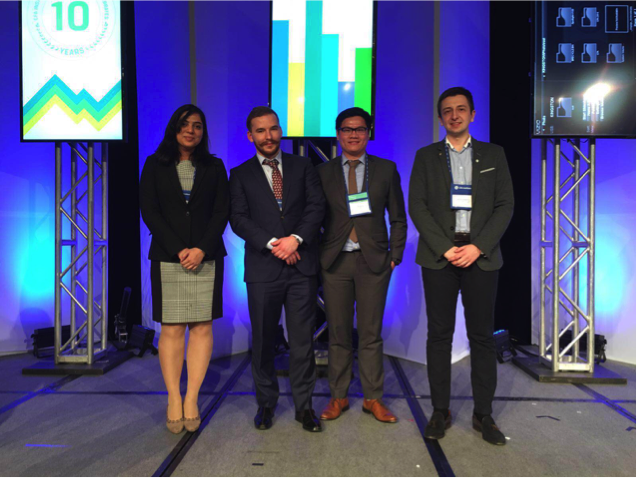 For 2016 ENGAGE partnered with CFA Institute to hold the Global Final of the CFA Research Challenge, an annual event that has attracted more than 15,000 students from over 1000 universities. The conference began with a discussion regarding the U.S. economy and the possibility for Federal Reserve to raise interest rate from Dennis Lockhart. Mr. Lockhart is president and CEO at the Federal Reserve Bank of Atlanta, and a member of the Federal Open Market Committee. Before the conference, we had already anticipated rising interest rate and built a defensive strategy for our U.S. Equity Portfolio. After Mr. Lockhart’s speech, we realized that the Fed might only raise rate two times at most for this year, far from its plan of several rate hikes as the U.S. and the global economy had shown weak performance. The second keynote discussion was related to global economy with participation from James Bianco, Jeffrey Rosenberg, Mark Zandi and Rick Santelli. The conference was filled with laughs after a huge debate between Mr. Zandi and Mr. Santelli. At this point, we had covered many aspects of fixed-income securities, commodities and alternative investments that were valuable for SIAS and our knowledge. The third keynote was regarding equity market and the panel was comprised of Robert Doll, Stephanie Link, Bill Miller and Anthony Scaramucci. To acknowledge the esteem of the group, one must realize that they had over $956 billion in assets under management. The conference ended with a discussion of the most talked topic in finance industry, ESG – Environmental, Social and Corporate Governance. Towards the end of the conference, we stayed back to network with students from other universities. It was a surprise for us to find out that they knew about SIAS, and some students had put forward ideas to have a student-run fund at their universities. We exchanged our opinions on issues discussed at the conference, investment strategies and career goals. It was definitely a great opportunity to interact with and learn from students who were passionate about finance and would strive to be the best in the future. While watching the Global Final of the CFA Research Challenge, we appreciated the fact that what we were doing in SIAS was similar to the industry’s process and expectation. As I look back, ENGAGE is a great learning opportunity for anyone who seeks a career in finance. It is the place where like-minded people get together, discuss and learn. I would encourage next cohorts of the M.Sc. Finance programme to participate in ENGAGE and many other events as they will come across valuable lessons that are important to achieving their career goals. I also want to express my gratitude toward Beedie School of Business for supporting the team at the ENGAGE conference. I hope that the school will continue to support next cohorts. An Hoang (Head Trader and Analyst), Sukmanjot Brar (Chief Compliance Officer), Dmitrii Desiakov (Chief Risk Officer), and Savva Cherdantsev (Global Equity Analyst) are members of the Student Investment Advisory Service Fund (SIAS), one of the largest student-run investment funds in North America with over $15.6 million in assets under management. After their graduation in December 2016, they are looking for opportunities in compliance, risk management and investment banking.